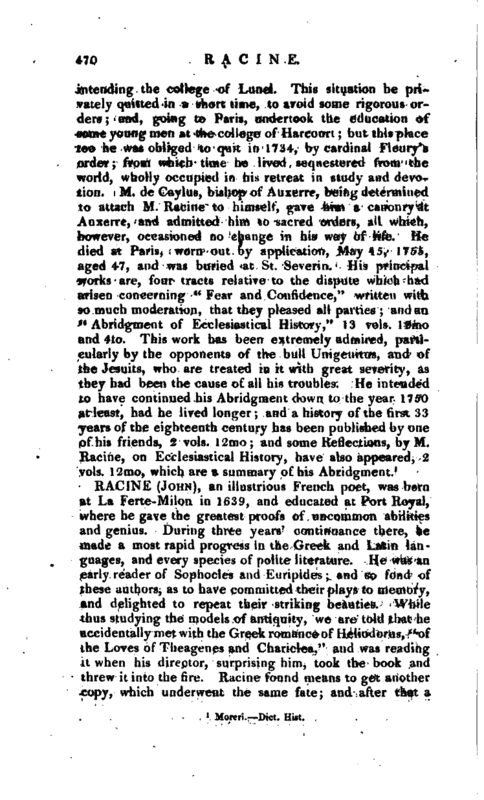 Leaving Port Royal, he went to Paris, and studied logic some time in the college of Harcourt. He had already composed some little pieces of French poetry, but it was in 1660, when all the poets were celebrating the marriage of the king, that he first discovered himself to the public. His “La Nymphe de la Seine,” written upon that occasion, was highly approved by Chapelain and so powerfully recommended by him to Colbert, that the minister sent Racine a hundred pistoles from the king, and settled a pension on him, as a man of letters, of 600 livres, which was paid him to the day of his death. The narrowness of his circumstances had obliged him to retire to Usez, where an uncle, who was canon regular and vicar general there, offered to resign to him a priory of his order which he then possessed, if he would become a regular; and he still wore the ecclesiastical habit, when he wrote the tragedy of “Theagenes,” which he presented to Moliere and that of the “Freres Ennemis,” in 1664, the subject of which was given him by Moliere. In the mean time, the success of his ode upon the king’s marriage led him to loftier attempts, which ended in his becoming a writer for the theatre. In 1666, he published his tragedy of “Alexandra;” concerning which Mr. de Valincour relates a fact, which he had from Racine himself. Reading this play to Corneille, he received the highest encomiums from that great writer; but at the same time was advised by him to apply himself to any other kinds of poetry, as more proper for his genius than dramatic. “Corneille,” adds de Valincour, “was incapable of low jealousy if he spoke so to Mr. Racine, it is certain that he thought so. 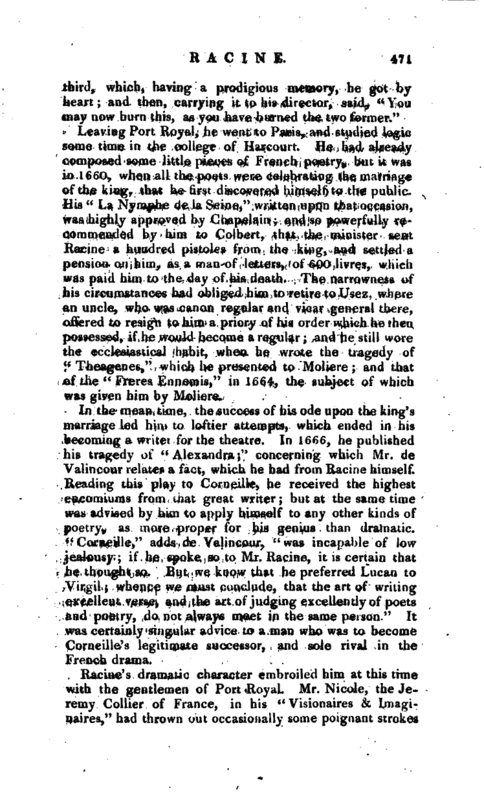 But we know that he preferred Lucan to Virgil whence we must conclude, that the art of writing excellent verse, and the art of judging excellently of poets and poetry, do not always meet in the same person.” It was certainly singular advice to a man who was to become Corneille’s legitimate successor, and sole rival in the French drama. Racine’s dramatic character embroiled him at this time with the gentlemen of Port Royal. Mr. Nicole, the Jeremy Collier of France, in his “Visionaires & Imagifiaires,” had thrown out occasionally soine poignant strokes | against the writers of romance and poets of the theatre, whom he called the public poisoners, not of bodies, but of souls “des empoisonneurs publics, non des corps, mais desames.” Racine, considering himself as included in this censure, addressed a very animated letter to Nicole; in which, without entering deeply into a defence of his brethren, he endeavoured to turn into ridicule the solitaires and religious of the Port Royal. M. du Bois and Barbier Daucour having each of them replied to this letter, Racine opposed them in a second, all which, originally published in 1666, are to be found in the edition of Racine’s works 1728, and also in the last editions of the works of Boileau. In 1668, he published“Les Plaideurs,” a comedy, and a close imitation of Aristophanes and “Andromache,” a tragedy, which was much applauded and much criticised. Some however think it his first good tragedy. He continued to exhibit from time to time several excellent tragedies “Britannicus,” in 1670; “Berenice,” in 1671; “Bajazet,” in 1672 “Mithridates,” in 1673 “Iphigenia,” in 1675; “Phaedra,” in 1677. 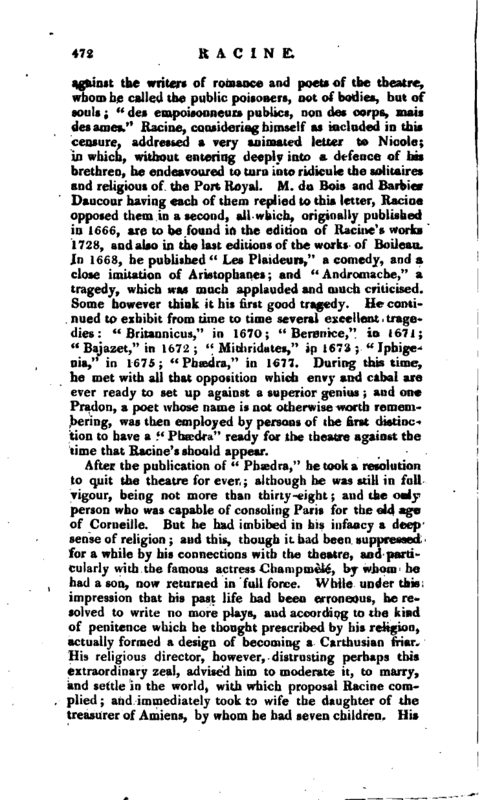 During this time, he met with all that opposition which envy and cabal are ever ready to set up against a superior genius; and one Pradon, a poet whose name is not otherwise worth remembering, was then employed by persons of the first distinction to have a “Phaedra” ready for the theatre against the time that Racine’s should appear. After the publication of “Phaedra,” he took a resolution to quit the theatre for ever although he was still in full vigour, being not more than thirty-eight and the only person who was capable of consoling Paris for the old age of Corneille. But he had imbibed in his infancy a deep sense of religion; and this, though it had been suppressed for a while by his connections with the theatre, and particularly with the famous actress Champmel6, by whom he had a son, now returned in full force. While under this impression that his past life had been erroneous, he resolved to write no more plays, and according to the kind of penitence which he thought prescribed by his religion, actually formed a design of becoming a Carthusian friar. His religious director, however, distrusting perhaps this extraordinary zeal, advised him to moderate it, to marry, and settle in the world, with which proposal Racine complied and immediately took to wife the daughter of the treasurer of Amiens, by whom he had seven children. 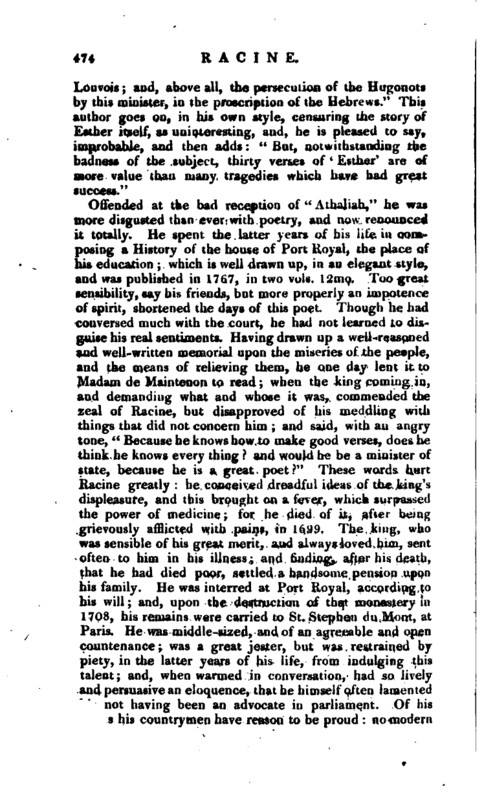 His | next concern was to reconcile himself, as he did very sincerely, with the gentlemen of Port Royal, whose censures on dramatic writers he acknowledged to be most just. He made peace at first with Nicole, who received him with open arms and Boiieau introduced him to Arnaud, who also embraced him tenderly, and forgave all his satire. 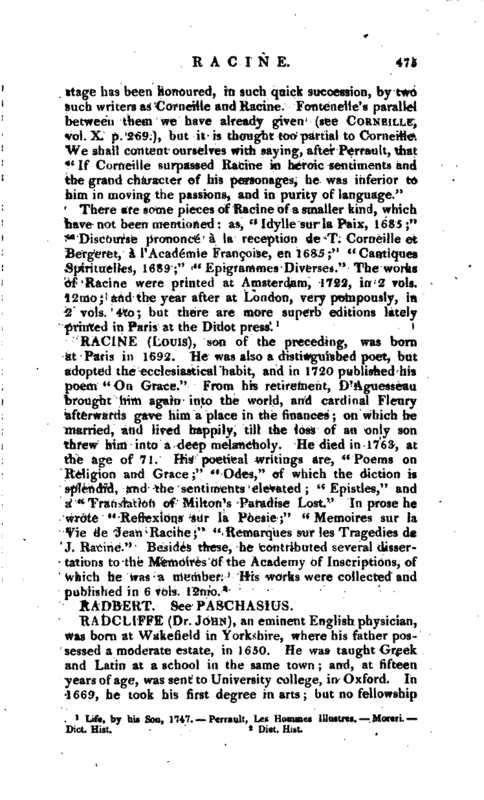 Though Racine had made it a point of conscience never to meddle any more with poetry, yet he was again invited to resume his dramatic character by madame de Maintenon, who intreated him to compose some tragedy fit to be played by her young ladies at the convent of St. Cyr, and to take the subject from the Bible. 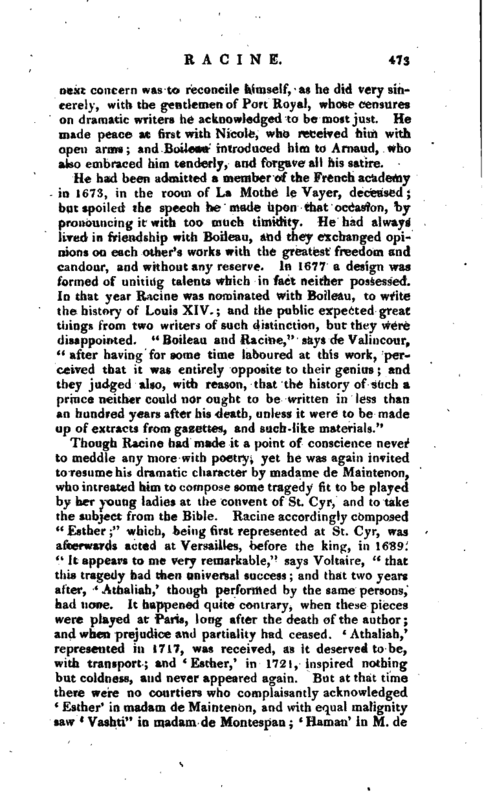 Racine accordingly composed “Esther” which, being first represented at St. Cyr, was afterwards acted at Versailles, before the king, in 1689. “It appears to me very remarkable,” says Voltaire, “that this tragedy had then universal success and that two years after, l Athaliah,‘ though performed by the same persons, had none. It happened quite contrary, when these pieces were played at Paris, long after the death of the author and when prejudice and partiality had ceased. ’ Athaliah,‘ represented in 1717, was received, as it deserved to be, with transport; and ’Esther,‘ in 1721, inspired nothing but coldness, and never appeared again. But at that time there were no courtiers who complaisamly acknowledged 4 Esther’ in madam de Maintenon, and with equal malignity saw Vashti” in madam de Montespan ‘ Human’ in M. de | Louvois and, above all, the persecution of the Hugoriots by this minister, in the proscription of the Hebrews.“This author goes on, in his own style, censuring the story of Esther itself, as uninteresting, and, he is pleased to say, improbable, and then adds” But, notwithstanding the badness of the subject, thirty verses of ‘ Esther’ are of more value than many tragedies which have had great success." Life, by his Son, 1747. Perrault, Les Homines lllustres. —Moreri. —Dict. Hist.